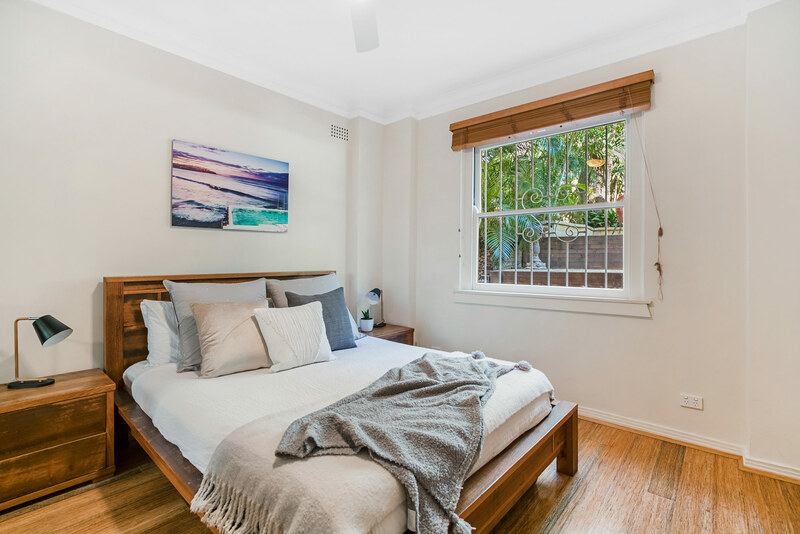 Imagine staying just 3 minutes' walk from iconic Bondi Beach! That's what's on offer at this 1 bedroom, 1 bathroom Beach Peach holiday apartment. 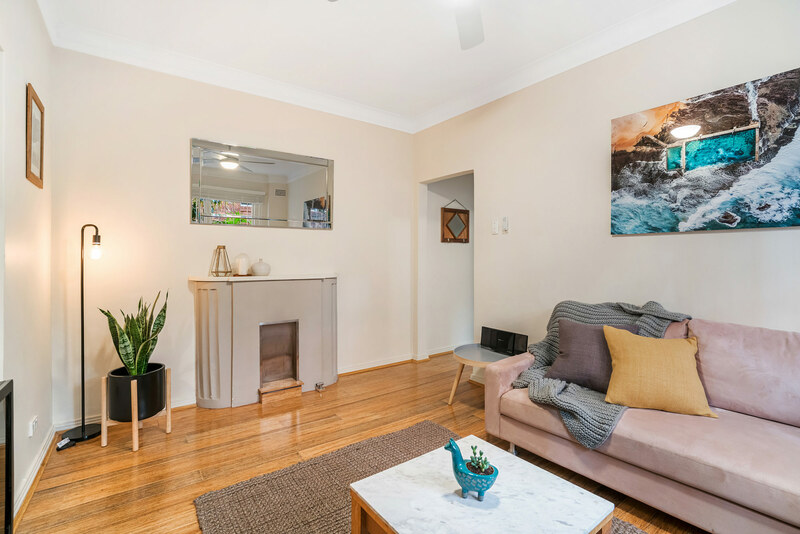 Newly decorated and appointed, this light bright apartment features art deco flair, polished wood flooring and ceiling fans. Ideal for 2 adults and 2 children, it provides a queen size bed in the large bedroom plus a sofabed in the lounge. 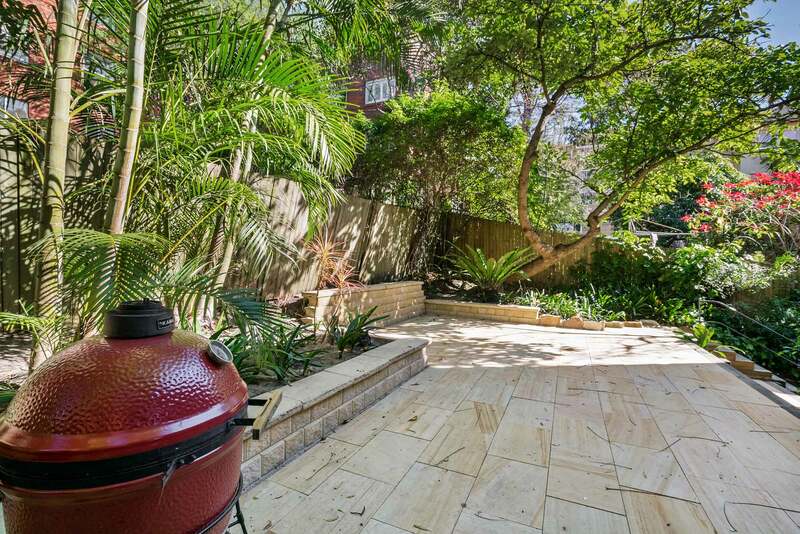 The paved patio is ideal for evening drinks and al fresco barbecues. 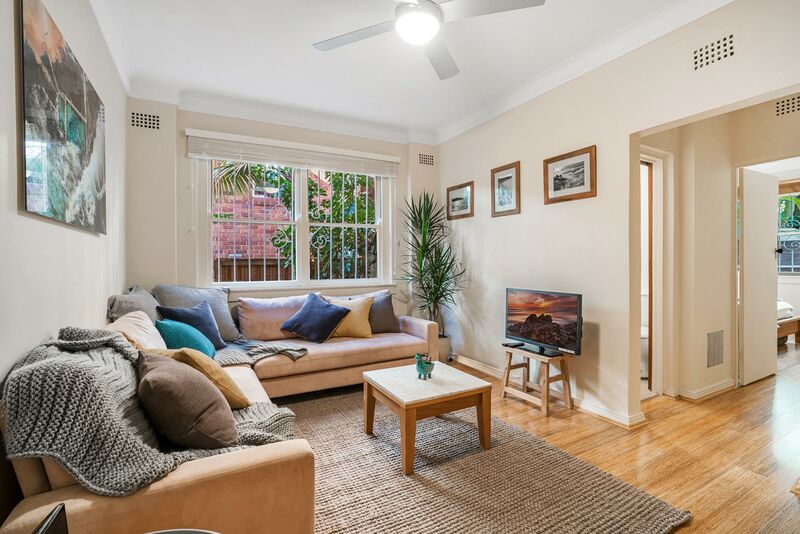 Located on the ground floor at the back of the building, Bondi Beach Peach offers easy access for luggage and beach paraphernalia while privacy and peace is assured. Sydney's attractions are 5km away and are easily reached by local bus. 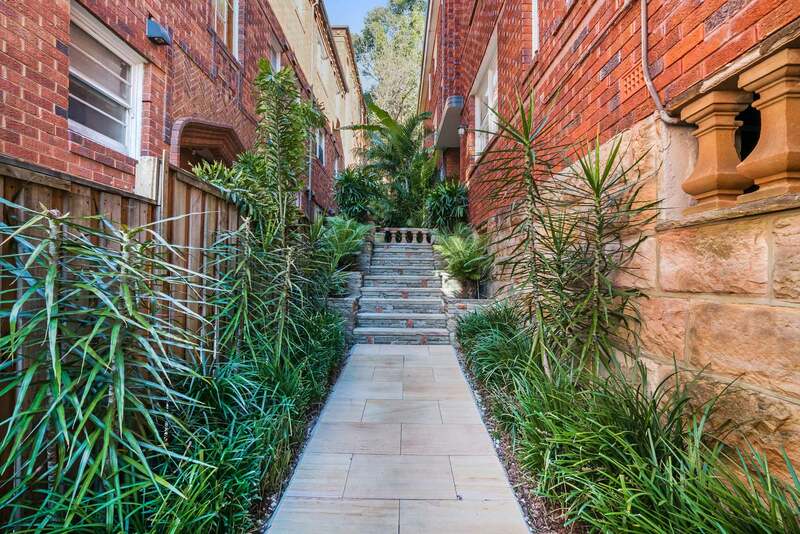 3 minutes' stroll from Bondi Beach! * Please note there there are no laundry facilities at this property. The spacious living area offers ample natural light pouring through the large picture window. The two sofas are arranged in an L-shape around the coffee table and TV. The polished wood floor runs throughout the apartment and are covered with a rug in the lounge. 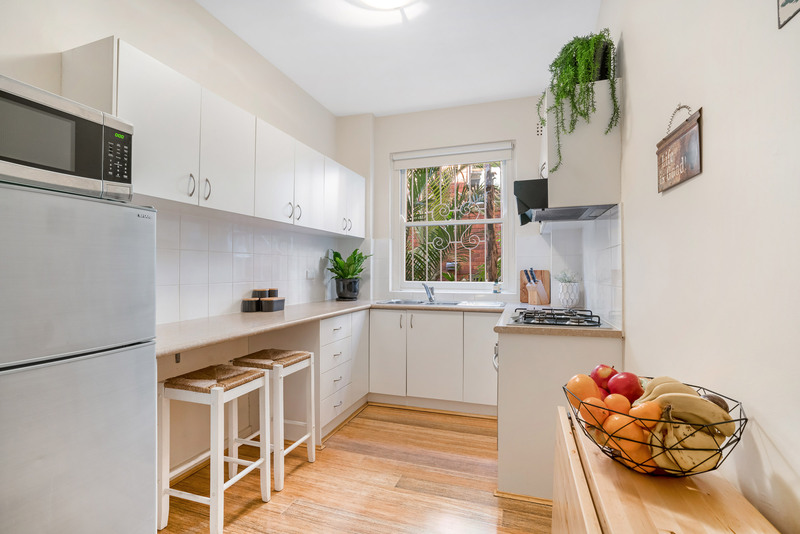 The fully equipped kitchen features all-white cabinetry and a handy breakfast bar for two with additional seating on the cane stools at the fold-away dining table. The fridge/freezer, microwave and oven/hob make self-catering a pleasure. 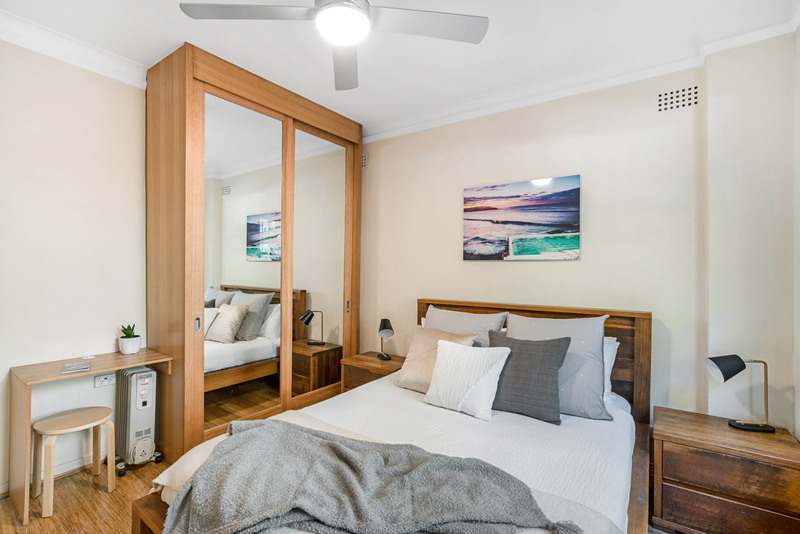 The bedroom features a mirrored wardrobe, wooden bed, ceiling fan and side tables. 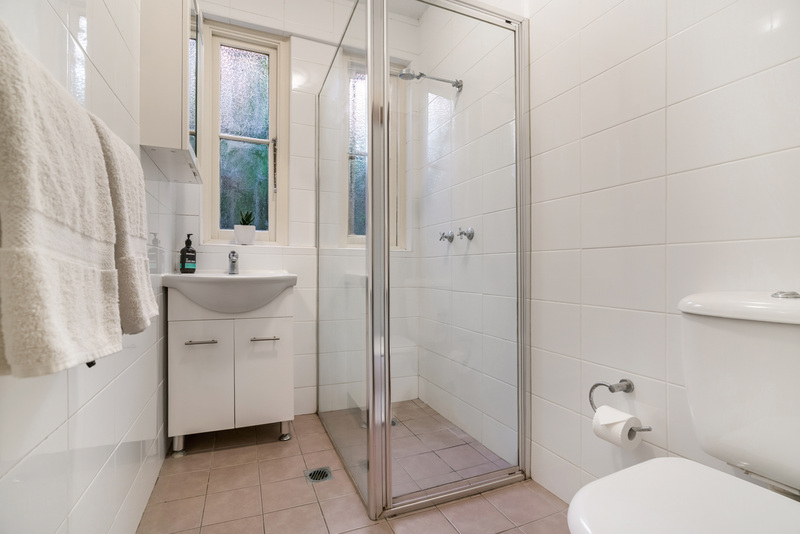 The bathroom offers a glass shower cubicle and modern vanity sink. 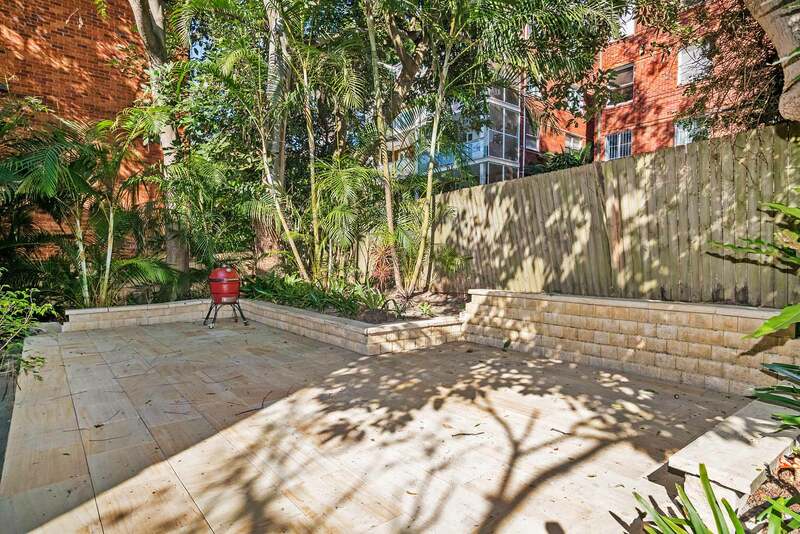 The private courtyard garden is paved and provides a delightful space for relaxing with drinks. 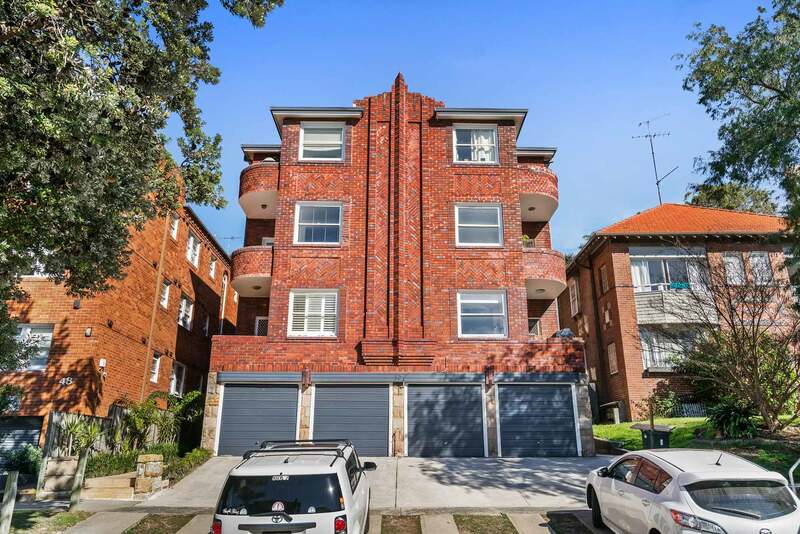 There is no garage or off-street parking at Bondi Beach Peach, parking is on-street only. The driveway parking shown in front of the building is allocated specifically to other units in the building. We recommend guests utilise public transport if possible as street parking is metered. The nearest bus stop is on Campbell Parade at Bondi Beach, 350m from the property. 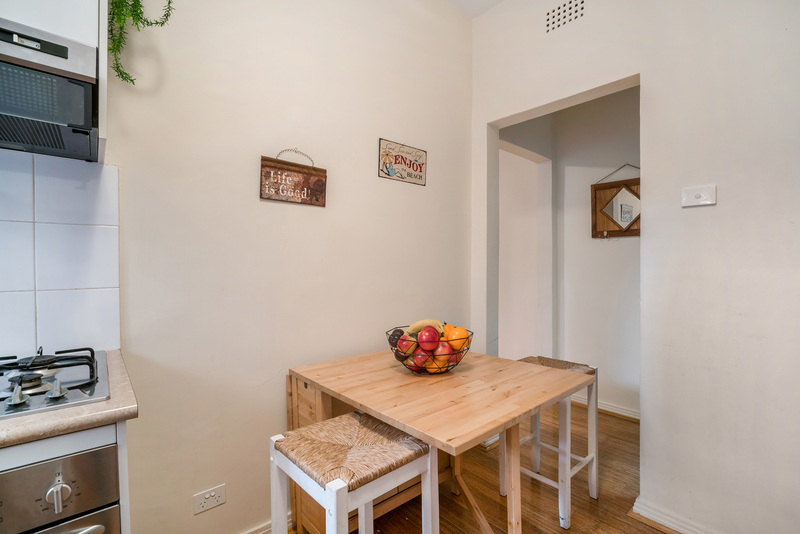 Bondi Beach Peach is centrally located less than 5 minutes on foot from the beach, cafés and local shops. 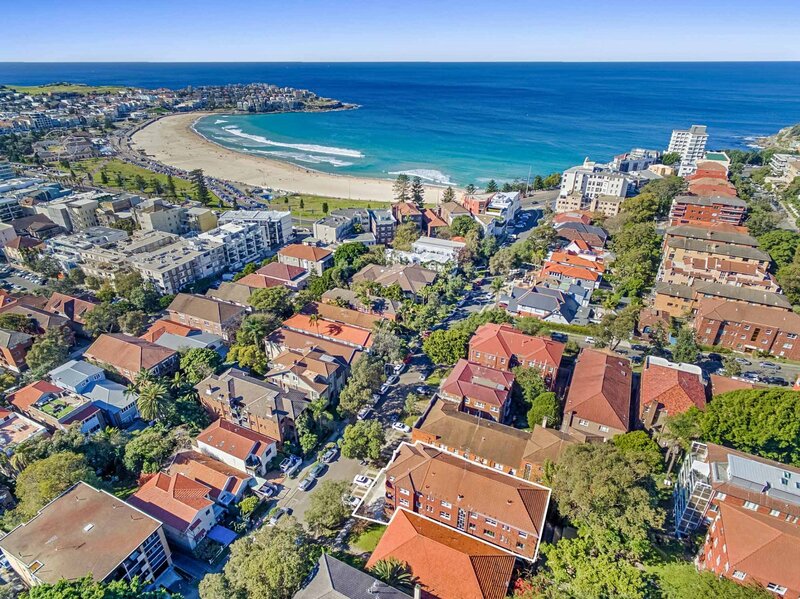 Visitors can look forward to scenic clifftop walks from Bondi to Coogee and cool swims in the famous Icebergs swimming pool nearby. 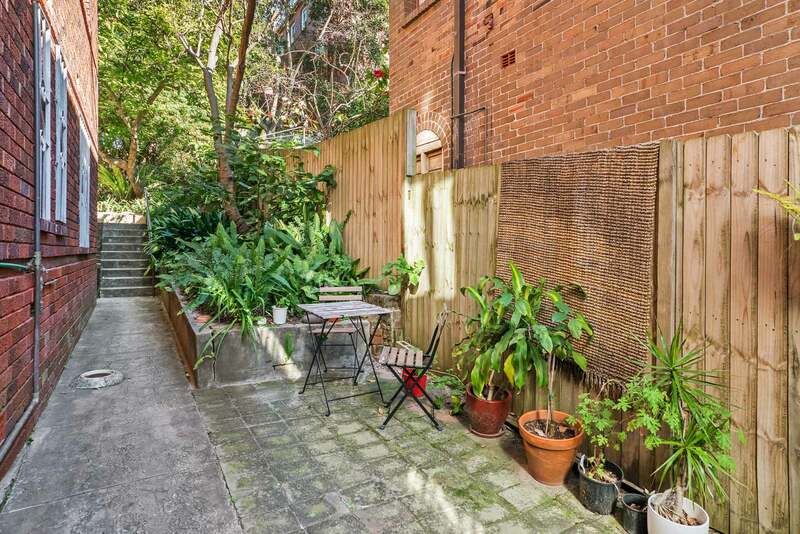 One minute from this Beach Peach apartment is the bus stop with regular buses into Sydney, 5km away. 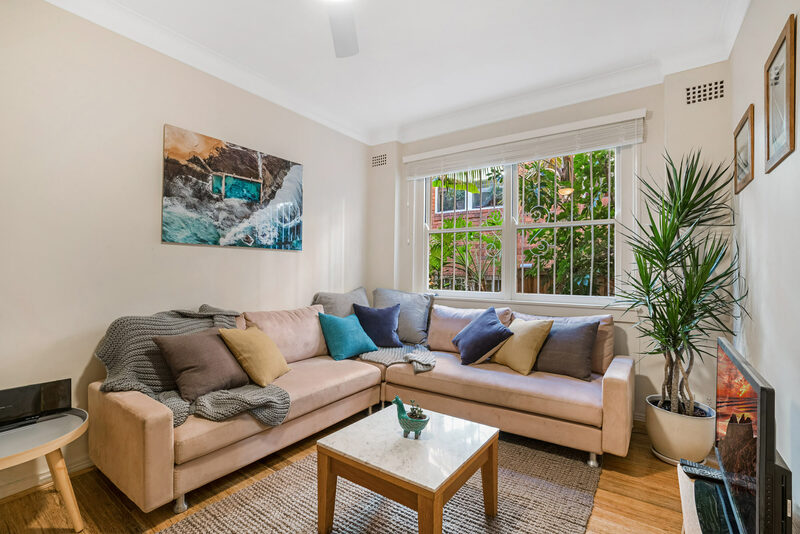 It's easy to spend a week exploring the area touring Sydney Opera House, strolling around the Botanical Gardens and enjoying the view from Mrs McQuarrie's famous chair. 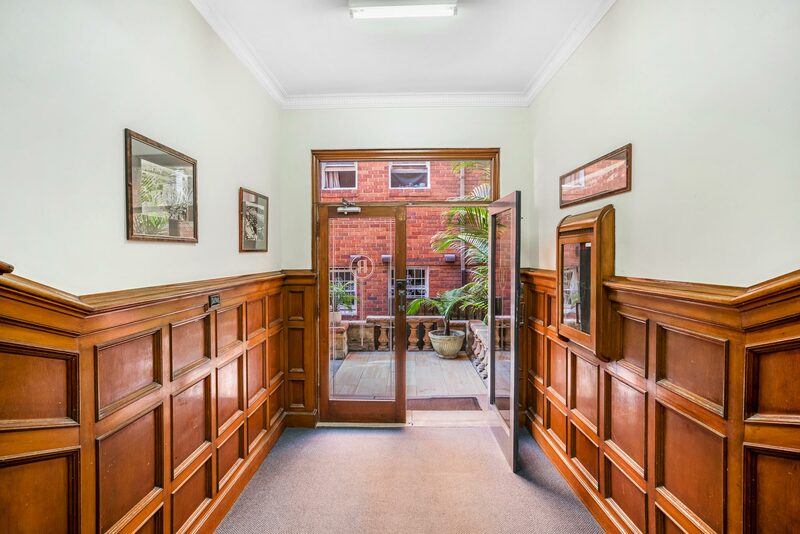 Explore the historic Rocks district with a guide and learn more about local history in the Rocks Discovery Museum or the Museum of Sydney near Circular Quay. Take a cruise around Sydney Harbour, hop aboard a ferry to Manly Beach or climb the Sydney Harbour Bridge – if you dare! There's plenty of city shopping, lively bars and restaurants to keep you busy throughout your stay at Bondi Beach Peach. Sydney Airport is 30 minutes away and can be accessed by bus then train, or direct by taxi. Ideal for surfers, romantic getaways and couples' city breaks within easy reach of Sydney's cultural attractions, shops and restaurants. Group restrictions - maximum of 3 adults at the property unless otherwise approved directly with A Perfect Stay. Great location, we used the bus and taxis, parking is near impossible, appartment good. The location was truly perfect. Loved it. We'll definitely stay there again for our next visit.